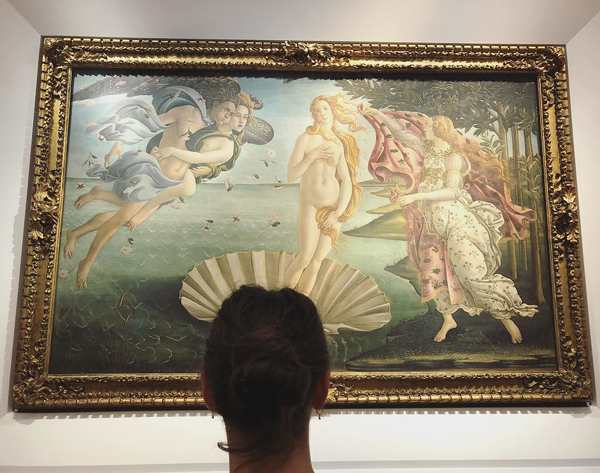 RIO GRANDE VALLEY, TEXAS – UTRGV junior Suzanne El-Haj’s return from her study abroad courses in Italy left an unexpected feeling. “It kind of felt like it didn’t happen, because it was so unreal. Everything that we saw – everything – was so beautiful,” said El-Haj, an environmental science major from Mission. Julio Longoria, a UTRGV senior philosophy major from Rio Grande City, shared the sentiment. “Pictures or videos don’t do it justice,” he said. 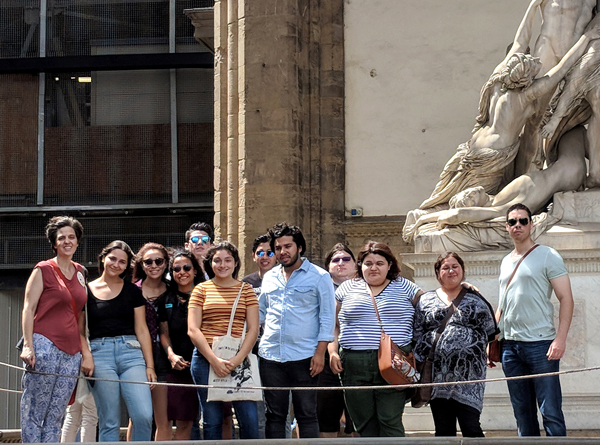 El-Haj and Longoria were two of 14 students who made the trip to Italy as part of a study abroad curriculum led by Donna Sweigart, a UTRGV associate professor of art. “When you go somewhere else, you learn so much more about yourself and you learn more about how to relate to other people, how to relate to other cultures, understanding differences and how different cultures live their lives,” Sweigart said. Both El-Haj and Longoria enrolled in more than one course for the trip to Florence, Italy, and each class approached the country from different aspects. “There was a studio art class, an engineering course, a literature course on Dante, and my own course, which was the history of math and science in the early Renaissance period,” said Dr. Greg Gilson, an associate professor of philosophy in the UTRGV College of Liberal Arts. He said Sweigart asked him to be part of the complementary courses. Sweigart said multiple viewpoints expand the learning potential of any given subject. El-Haj said the studies took full advantage of the location. “That really went hand-in-hand, and it really helped us learn better,” she said. The UTRGV junior said that while travel is what attracts students to study abroad programs, people play a very important role. “It’s not just the location of where you are. It’s also the people that make it what it is and make it enjoyable,” she said. The trip provided insight not just into the living locals, but also those who lived in Italy in the past. Longoria said he gained a new appreciation of the philosophers he has studied. This is Longoria’s second study abroad trip. “You get to experience a whole different culture and see the world,” he said. El-Haj urges others to take a study abroad course. “It’s important to get out of your comfort zone,” she said, “to learn new things, to see different cultures. Because that’s how you really understand different people, different languages and different foods. To learn more about the UTRGV study abroad program, visit https://www.utrgv.edu/ipp/study-abroad/index.htm. Beatriz Rodriguez, Interdisciplinary Studies, Brownsville. Julio Longoria, Philosophy, Rio Grande City. Suzanne El-Haj, Environmental Sciences, Mission. Francisco Velasco, Civil Engineering, Mission. Mariela Olguin, Interdisciplinary Studies, Matamoros, Mexico. Kelsey Rivera, Mechanical Engineering, Mission. Daiquiri Rodriguez, Interdisciplinary Studies, Mission.